Spooks was listed in GAMES Magazine's "The Games 100" for 2004. You don't have to outrun the monsters . . . if you can outrun your friends. In this fast-moving game, you play your cards by matching numbers and suits. The first player to empty his hand wins . . . and the spooks get everybody else! 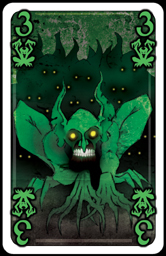 Each suit (Spiders, Ghosts, Goblins, Skeletons, and Bats) has a special rule, and the top card in each suit has a special power . 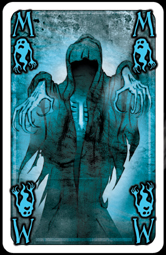 . . so you don't know who will be first to escape the haunted house until the final card is played. Spooks is a great quick party game . . . kids will enjoy it, too! 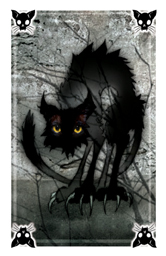 A review of Spooks from Flames Rising. 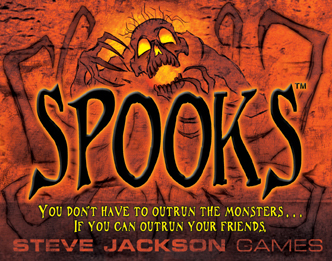 Discuss Spooks in the Steve Jackson Games Forums.